Announcement We welcome the Spring Equinox once more! It's that time of year to dust off the old glass nippers! Come along with me as I create some mosaic magic throughout the next few months. I am delighted and thrilled to welcome new customers into our shop and look forward to another wonderful year of exciting, groovy mosaic art. I find inspiration in nature. The colors of fall are my favorite to use when I mosaic with stained glass. Let me help you find some inspiration to decorate with throughout the year. Handmade items rock! FREE SHIPPING on all items (USA only). Support Independent Artisans, Designers and Crafters for your gift-giving needs all throughout the year. Thank you! We're on a few social media sites. Stop by and say hello! We welcome the Spring Equinox once more! It's that time of year to dust off the old glass nippers! Come along with me as I create some mosaic magic throughout the next few months. Mosaic Gazing Ball, Celestial Design, Dish Tiles and Mirror, Moon, Stars, Swirls, For The Home, Bohemian Style, Hippie Art, Wedding - 10 in. Beautiful!!! I love this piece!! Excellent communication! Thank you so much!! This moon is simply beautiful! Very well made. I've (you've) gotten many compliments. Thank you! Bright colors of stained glass are a favorite to use. Using items to recycle / repurpose is a big part of what I do. Mirror on a discarded tray. Pieces of broken china or pottery is still useful! Unusual discarded items can become works of mosaic art. Starting out slowly in 2005 by giving mosaic gifts I had made, I eventually found what materials I liked, how I liked to use them and what tools were my favorite. My design preferences involve suns, crescent moons, sparkly stars and swirls or wavy lines of intense color used in an abstract way. Geometric shapes of stained glass and mirror are used to create what I call scrap art. When using dish tiles or shards my style can be associated with folk art. Art has always been a part of my life. Growing up in a river town in New Jersey in the late 60's early 70's only a small bridge away from New Hope, PA, I had the pleasure of walking over the bridge of the Delaware River daily into a whole universe of creativity. The smells of the water and fish from the river, strawberry incense and Hendrix guitar licks wafting through the head shop just off of the bridge into town is my most distinct memory. As a teenager, I found the psychedelic posters and trippy music within the store a favorite place to go. At the time I didn't realize that everything has an energy to it but even as a young teenager I felt an electric spark that would stay with me forever during those early years. I felt at home walking along the street gazing at all the shops filled with abstract paintings, pottery, being so close to theatre, coffee houses, restaurants with live jazz bands and boutiques of all kinds. These were my people! An energy never lost by the muse who guides me now was made throughout those early years. My mosaics are often made using small scrap pieces of stained glass and recycled mirror. Pieces of broken dishes and mugs are used giving them new life. Discarded wine and beer bottles become bottle art that shine and glow when placed in a window or near a lamp. Microwave plates become sun catchers filled with color. Broken pieces of jewelry, buttons, seashells, rocks and stones get placed in my work and are often focal points. A lot of me goes into every piece I work on. Nurturing my art allows the art to nurture me. I'm proud of my work and would love everyone to find the same joy I feel when creating art. My alter ego, EarthMotherMosaics makes handmade mosaics, home decor and art. My muse and I have been making mosaics for a little over 12 years and am self-taught. Bohemian and hippie inspired art is what I love to create. In the event you order an item and for some reason you just don't like it when it arrives, but there is no damage, then I will certainly offer you an exchange for another item at the same price (does not apply to custom made to order items). It must be returned to me in it's original packaging within 14 days after you receive it. You will be responsible for the return S&H fee. I do the best I can when shipping out my art to wrap it securely, but once it leaves our porch heading toward your door, I can't predict what will happen. Weather and other obstacles often cause a problem or two. If the item arrives to you damaged, for example a piece of glass falls off, please convo me, share photos and I will offer the best way to repair it, if possible, if you are willing to give it a try. If it is beyond your scope of repair, please return it to me (you pay for return shipping fees). I will repair it and return it to you at no additional cost to you. You will receive a full refund if your item(s) was destroyed beyond repair in shipping. We'll follow the USPS procedures for items damaged through them. Please contact me immediately should that be the case, take a photo of the item and the box as it arrived to you, to share with USPS. They will not issue a refund without this documentation. Payment must be paid-in-full within 5 (five) business days of order otherwise your order will be canceled. FREE Shipping (USA only). I use USPS Priority Mail for all mosaics. 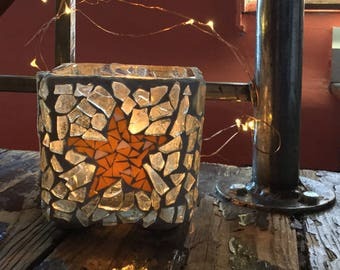 Whenever possible I place your mosaic within another box and secure it using bubble wrap, tape, tissue paper, packing peanuts, etc. I will do whatever is needed to make sure your mosaic gets to you in one piece. When you custom order a made-to-order item we will work closely together. If you'd like to make payments and have them broken up into two, I will be happy to send you invoices. We can discuss this through email further should you decide to pay in this way. If you choose to make payments, half of the payment (non-refundable) is due upon ordering your custom mosaic. This amount goes to supplies and materials required to make the mosaic. The other half of the payment can be sent to you through invoice when the work is completed. Your item(s) will not be shipped until payments are made. I do not offer refunds on custom made items. I try to be as clear as possible so that you will have enough knowledge to determine if you'd like to place an order. When you approach me regarding a custom order not shown here, whenever possible, I will provided photos of a similar item so you can see exactly what you are getting.